Platinum is one of the Earth's rarest and most valuable metals, which makes platinum stocks an intriguing investment for any portfolio. Materials scientists still haven't found a better catalyst than platinum group metals, or PGMs. 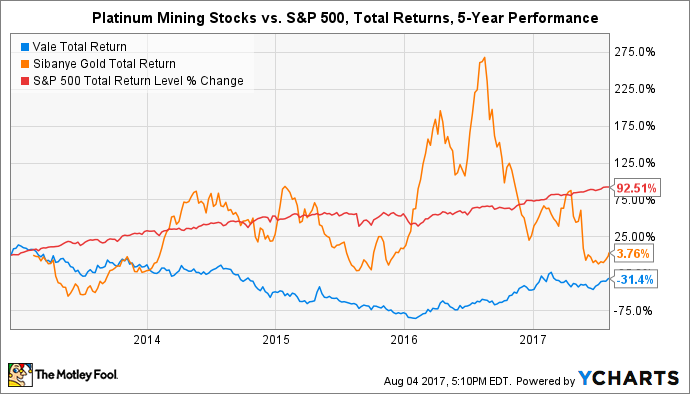 That means platinum stocks -- not all of which are platinum mining stocks -- will continue to offer long-term potential for investors. Unfortunately, there aren't many great ways to directly invest in platinum. Mining companies that focus exclusively on the metal are mostly incredibly risky microcap stocks, while major miners only obtain small parts of their overall business from the material. So, investors looking to gain exposure to platinum will need to consider industries and applications that rely heavily on it. That's what makes these the top five platinum stocks to buy right now. This is usually where most lists about platinum stocks begin (and end). Investors looking specifically for platinum mining stocks would undoubtedly come across Sibanye Gold and Vale SA. The former owns extensive assets in South Africa and the only platinum mines in the United States thanks to its recent acquisition of Stillwater, which was the largest PGM deal in the last 10 years. The later is a diversified mining company that produces about 5% of global PGM volumes each year. Unfortunately, both have failed to match the returns of the S&P 500 in the last five years -- a common theme among precious metals mining stocks. is currently restructuring its businesses to increase operational efficiencies for both its gold and PGM mining activities. The stock has suffered tremendously recently, but Sibanye Gold has a pretty respectable history of growing revenue and churning out a healthy amount of operating cash flow. If you are willing to bet on a big rebound, you should take a deeper look at this platinum stock. Meanwhile, Vale SA offers a bit more diversification. It mines about 5% of all PGMs globally each year, but is also a top global producer of iron ore, nickel, copper, and thermal coal. In fact, essentially all of the company's platinum and palladium production comes as a byproduct of its nickel mines (one-third of all global PGM production is a byproduct of nickel production). The company's stock has tumbled in recent years along with global commodity prices, although it has begun staging a comeback since early 2016. As selling prices for its products improve, that should improve the top line, bottom line, and operating cash flow -- all three of which are relatively healthy today. So, once again, investors willing to bet on the turnaround of another platinum mining stock could do much, much worse than Vale SA. Give it a closer look. Will you marry this stock? 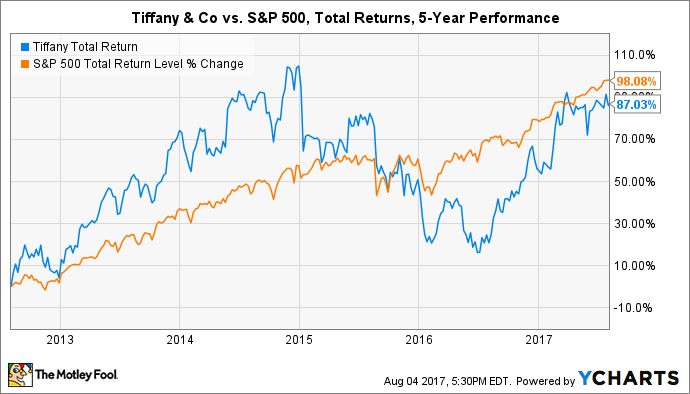 Investors looking for a platinum stock with lower risk than the two mining companies above may find comfort in Tiffany & Co. After all, jewelry is the second-most popular use for platinum globally, with the application consuming 16% of production. Tiffany & Co relies heavily on platinum in three of its four business segments, where the metal is molded into ring bands and the supports that hold diamonds and gemstones for bracelets, earrings, and necklaces. Most of the platinum sourced by the company comes from mines in the United States (there are only two, and they're both owned by Sibanye Gold) and recycling processes. While the jeweler is exposed to fluctuations in precious metals prices, Tiffany & Co stock offers shelter from the upstream risks experienced by platinum miners. It has achieved operating margins of at least 18%, operating cash flow of at least $615 million, and EPS of at least $3.57 for three straight years. And it may just be getting started: Wall Street expects the stock to be a huge beneficiary of recovering precious metals prices, which makes this a platinum stock to consider. Over half of all global PGM production from mines and recycling processes each year goes into the catalytic converters of vehicles with combustion engines. But a new automotive application is emerging: hydrogen fuel cell vehicles. In these cars and trucks, PGMs are needed to drive the all-important hydrogen reaction that powers the vehicle. Not only that, but hydrogen fuel cell vehicles need a lot more PGMs than their combustion engine predecessors. So although they aren't pure play platinum stocks, investors should still consider General Motors and Toyota when exploring opportunities involving the precious metal. They own the most and second-most global patents, respectively, for hydrogen fuel cells. Toyota has been a leader in alternative vehicles for over a decade. While the Prius lineup is still going strong, the company is investing heavily in its fuel cell portfolio. It even sells the hydrogen-powered Mirai in the United States right now, which benefits from a slew of breakthroughs from the company's engineering team. Those breakthroughs should aid the global auto industry, as Toyota has opened its patent portfolio to foster innovation and collaboration. General Motors is keen to collaborate, but has chosen Honda instead (which owns the third-most patents for hydrogen fuel cells globally). While Honda sells the hydrogen-powered Clarity in the United States today, the two are eager to address one of the single largest bottlenecks facing the technology: fuel cell manufacturing. In early 2017 General Motors and Honda announced a joint venture that aims to mass produce fuel cells in Michigan by 2020. It's a much-needed investment in the industry, as fuel cells are very difficult to make with large scale processes, often breaking during production. That alone has limited the advance of hydrogen fuel cell vehicles -- and stunted what could easily become the largest destination for platinum and PGMs. 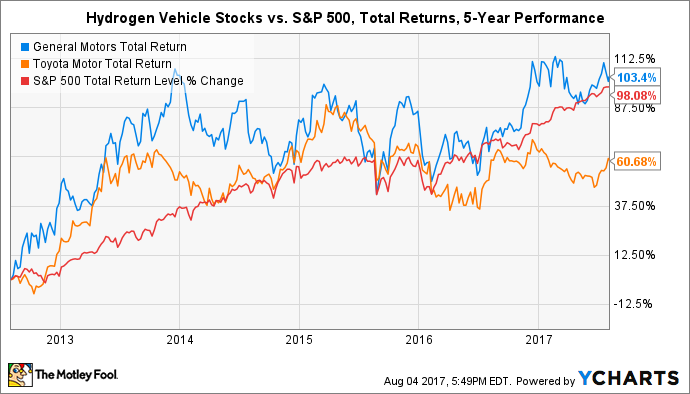 Thus, Toyota and General Motors offer a unique, low-risk opportunity to gain exposure to platinum's biggest opportunity, albeit in a roundabout way. Platinum is a truly valuable metal, not only due to price but also for its properties. From reducing ground level ozone emissions from the world's auto fleet to providing value for jewelers, the precious metal makes good on the hype. But investors looking for opportunities involving the material should look beyond only platinum mining stocks and consider companies that benefit from its use. How Big Is Vale's Dam Problem?